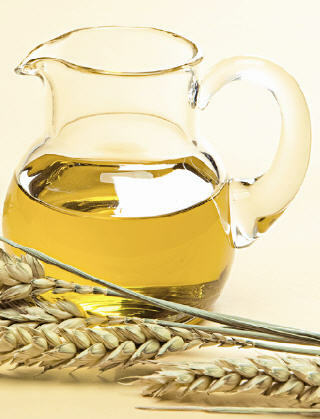 As the name suggests, wheat-germ oil is derived from the germ of wheat kernel, which is a good source of nutrients. The thick and sticky oil is deep amber in color and has a slightly nutty odor. It is high in vitamin A, B vitamins, vitamin D, vitamin E (more than other vegetable oils), beta carotene, and contains fatty acids, phytosterols, phosphatides, and octacosanol. Plus, it helps nourish dry, mature skin. In addition, this oil smoothes the skin, repairs sun damage, fades scars, treats blemishes, and strengthens your hair. Furthermore, wheat germ oil supports cardiovascular health, nervous system, immunity, and other physiological functions. Thus, it has medical as well as cosmetic uses. When applied topically, it stimulates the formation of new cells. Moreover, being rich in vitamin E, it works as a natural preservative. • Take four tablespoons of chickpea flour in a bowl and mix two tablespoons of sweet almond oil, one teaspoon each of fenugreek seed powder, turmeric powder, wheat-germ oil, and a quarter teaspoon of rose oil in it. Smear this paste on your body as a scrub. Finally, take a hot shower when it dries. It helps enhance your beauty, improves dull complexion, and relieves issues like eczema, psoriasis, boils, minor burns, etc. You can use it regularly for at least 40 days. • Massaging your skin with a combination of four tablespoons of organic coconut oil (melt it in a microwave or double-boiler), and two tablespoons each of wheat germ oil and tamanu oil is useful in reducing stretch marks, scars, sunburn, dermatitis, and healing dry, cracked skin. Moreover, it rejuvenates mature skin. You can also use this recipe on your hair and scalp for deep conditioning. Simply applying wheat germ oil, too, makes your hair soft, shiny, and strong. • When dealing with oily skin, you can nourish and hydrate yours skin by applying a mixture of three to four tablespoons of warm sage tea, two tablespoons of ground oatmeal, one tablespoon of ground flaxseed, and half a teaspoon of unrefined wheat germ oil. Leave it for about 20-30 minutes and then wash your face. Here’s a video showing how make a face cream with wheat germ and rose oil. • As wheat germ oil fights free radicals, you can use massage it onto your skin to reduce wrinkles and other signs of aging. • Make a facial mask simply by blending together one tablespoon each of wheat germ oil and applesauce. Wash and preferably, steam your face. Finally, apply this mask for about 10-15 minutes to nourish dull skin. • Prepare a homemade moisturizing cream by taking three tablespoons of wheat germ oil and adding three tablespoons of organic honey, one ounce each of witch hazel, glycerin, and half an ounce of rose water. • Mix two tablespoons of wheat germ oil, two tablespoons of sesame oil, four teaspoons each of walnut oil, hazelnut oil, and almost five drops each of ylang-ylang, and lavender essential oils. Apply the resultant oil about half an before sunbathing to protect the skin from sun damage. In case you have dry skin, prepare a homemade skin care recipe by combining four teaspoons each of wheat germ, walnut, hazelnut, and avocado oil. Furthermore, add six drops of calendula and four drops of patchouli essential oils in it. Besides, wheat germ oil can be used as a dietary supplement to boost energy, improve the lymphatic and reproductive systems, reduce LDL, that is, bad cholesterol and benefit the cardiovascular system. Those of you who have wheat allergy, however, should not use this oil. As wheat germ oil does not have a long shelf life, it is likely to turn rancid soon. Thus, make sure you store it in the refrigerator. In addition, you may mix it almond oil or olive oil to increase its shelf life.